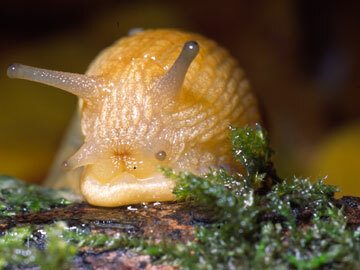 I feel like a terrible slug tonight. My gym is not open on Sundays and I did nothing physical today. Shame, shame, shame on me. Yes, I could have gone for a nice walk through my neighborhood, but, at this point, taking blood sugar issues and the outside temperatures into consideration... well, if I'm going to pass out or fall down, I'd rather do it in an air-conditioned gym with a phone nearby. So, here I am, feeling rotten and bloated. I plan to be in bed by 11 tonight and up at 6:30 tomorrow, ready for the gym. After working my way back up from total apathy after The Incident at my former hellish place of servitude, I'm ready for 60 minutes on the treadmill now. I'd like to do the elliptical trainer, but it plays havoc with my knees, so it's a no-go. Have you seen me? They call me... 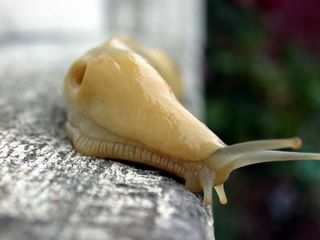 The Slug! I'm not going to say much about my attempts to un-slugify myself. I'm just going to do it. Psychologically, it's a struggle right now. Caring about going to the gym gets caught up in the whole "no money for rent or groceries" thing, and it's just not good. I just have to do it. Just like slogging through the job websites, it's just something I have to do. If any of you are struggling with your weight or your self-esteem or your loneliness or your joblessness - you are not alone, my little fellow slugs and slug-ettes. There's a big old forestful of us out there, just trying to slip and slide and inch along on our little slime trails, avoiding the big Timberland boots pounding down the path of life. So, hang in there, all you wonderful banana slugs. Someday, we'll all evolve.